TJF Click Nippon article "Bringing Seifuku to the World!" 1. Distribute Worksheet 1 and read through with students. Help students understand the words they do not recognize. 2. 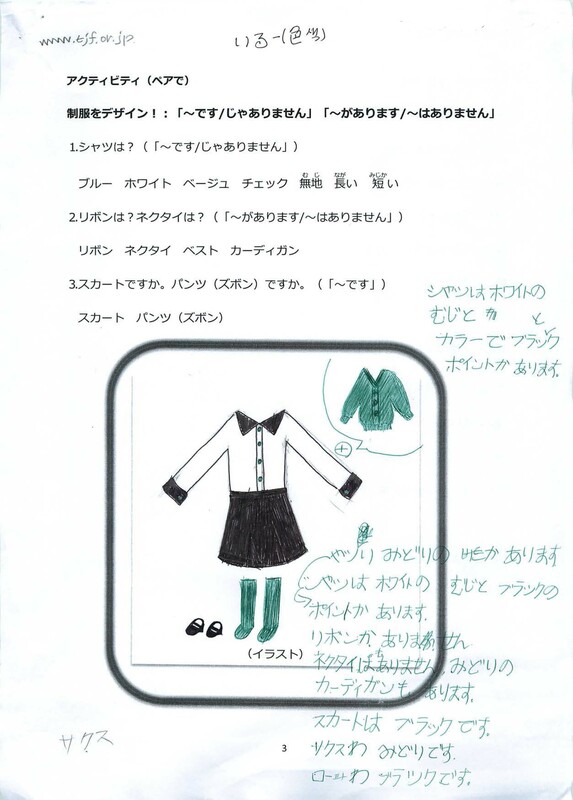 After the reading of the worksheet up to Activity, ask students in Japanese about the uniforms in their schools. 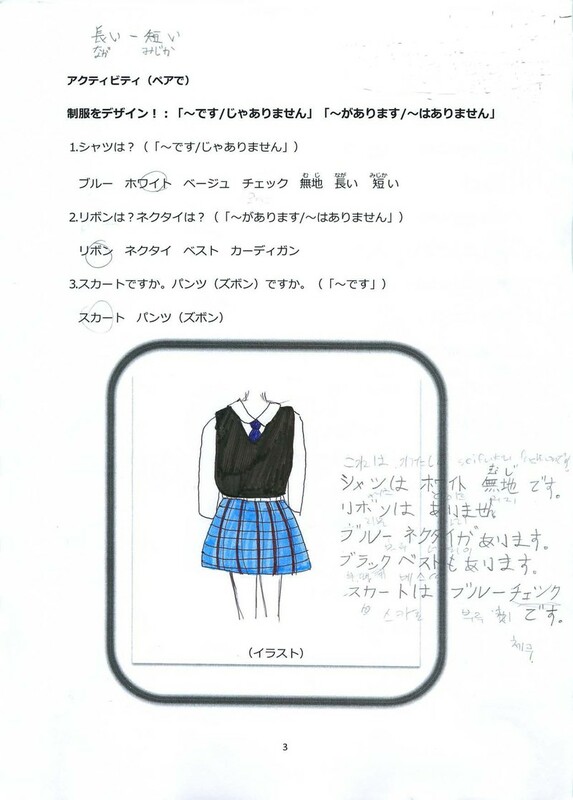 Teacher: What are the skirts of high school uniforms like? Are they long? Short? Student: They're long. And black. Teacher: Do you like wearing a uniform? Student: Yes. I like it/No, I don't like wearing a uniform. Teacher: Think of yourself as a school uniform designer. 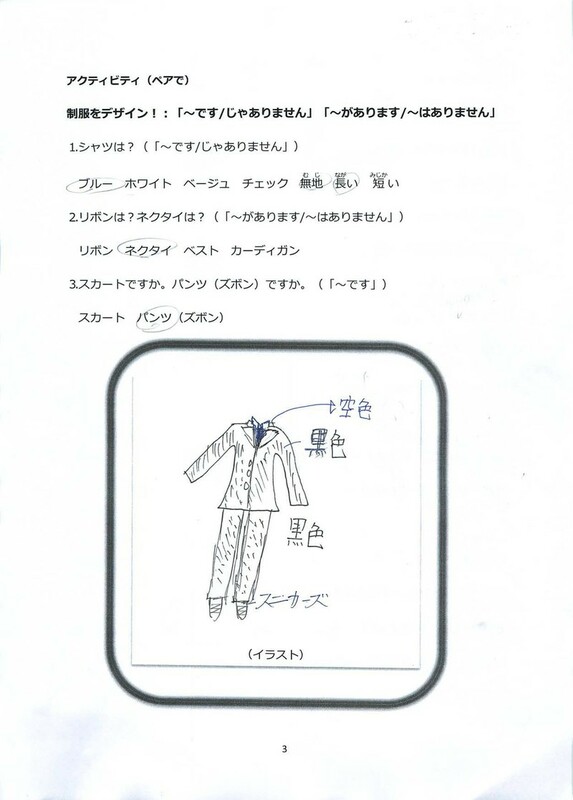 You will design a school uniform. 4. Looking at the photographs in the TJF Click Nippon article "Bringing Seifuku to the World!," bring students' attention to the words needed in designing a uniform (シャツ、スカート、無地、チェック、リボン、ピンク、ベージュ; shatsu, sukaato, muji, chekku, ribon, pinku, beeju,etc) and write them on the board while talking to students to confirm their understanding of the words. Elaborate on the conversation with various comments and questions like "Is it cute?" "Is it attractive?" etc. 5. 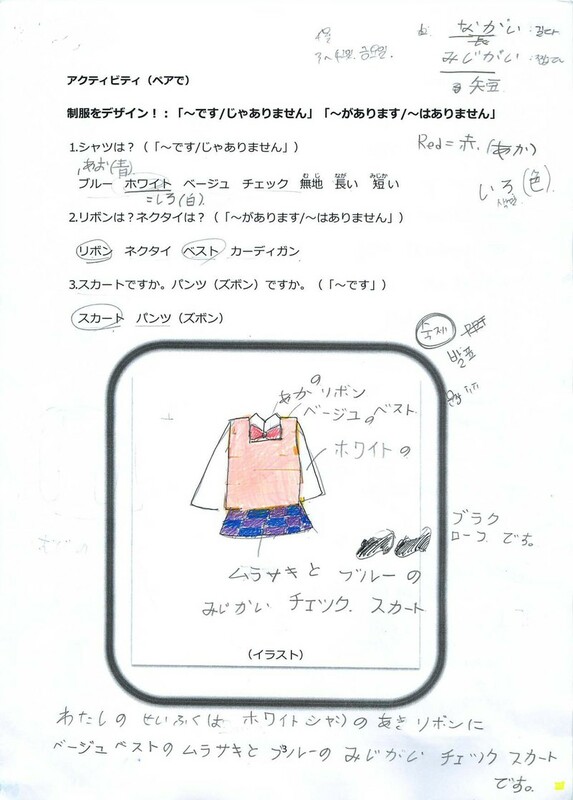 After having confirmed the words for Japanese school uniform designs, the individual pieces of apparel, colors, and other words, instruct students to look at the last page of the worksheet. Review the vocabulary and grammatical forms introduced thus far. 6. Then, calling on the students: "Let's hold a design contest!" announce that each student will be asked to give a verbal presentation of his/her design. Then the teacher should give an example presentation. Example: "This is my uniform." "It has a shirt and skirt". "It has a ribbon." "The shirt is white (shiroi/howaito)." ["This is the skirt."] "It is long." "The ribbon is red.' "Arigato gozaimashita," etc. 7. 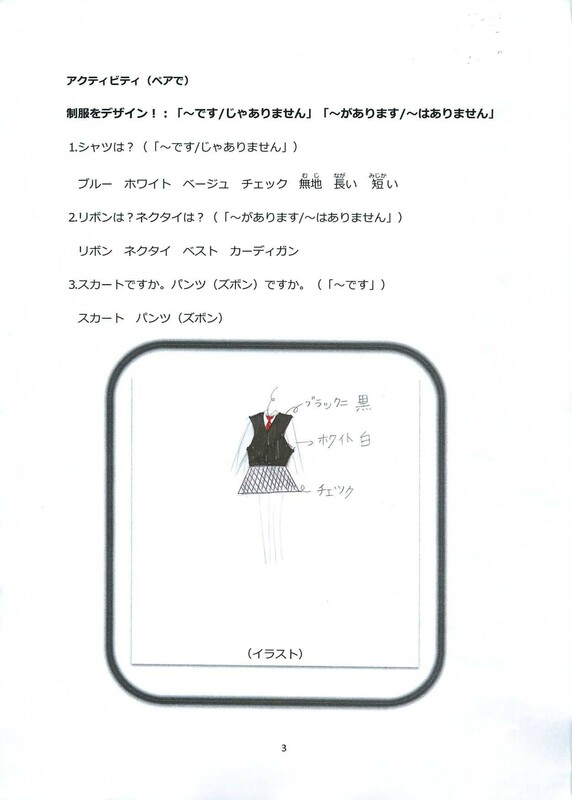 Using the worksheet, have the students choose shirt, trousers, skirt, etc., and select a design. Then have them draw their chosen design in the square indicated and color it as desired. Have them prepare notes about what they will say in their presentation, writing them down beside the picture or on the back of the worksheet provided (so that they can check their notes when they are speaking). Listening to each designer's work, the other students write in the colors and designs on Worksheet 2. To encourage concentration of attention on listening, have students ask any questions they might have. This kind of participation may be used for evaluation/grading. 9. In accordance with the atmosphere and configuration of the class, rank the presentations in order or have students comment on and point out the good points of each design, or use other activities to promote exchange among the students and their understanding of the content.